Warren Gatland OBE is the Head Coach of Wales’ International Rugby team. He is also the Head Coach of the British and Irish Lions. A former All Black, Gatland made his debut for the New Zealand rugby squad in 1988. Gatland was a regular in the All Blacks until 1991 playing in 17 non-international matches. Between 1986 and 1994, Warren made 140 appearances for Waikato – a club record at the time. On retirement in 1995, he became the senior coach at Taupiri. He later coached in Scotland and Ireland before being named coach of the Irish national squad in 1998 – a position he held to the end of 2001, including almost coaching the Irish to an historic upset victory against the touring 2001 All Blacks. Gatland then went onto coach London Wasps in 2002 and in early 2005 came back to New Zealand to take over coaching his beloved Waikato side in the NPC. In November 2007, Warren Gatland was named as the new head coach of Wales. After just 4 months of holding the position, Warren had led Wales to the 2008 RBS 6 Nations championship title and the nation’s tenth Grand Slam. He replicated that achievement in 2012. In September 2012 he was appointed Head Coach for the 2013 British and Irish Lions Tour of Australia. The Lions won the Test series against Australia 2-1. He was appointed Officer of the Order of the British Empire (OBE) in the 2014 Birthday Honours for Services to Rugby. In December 2013, Gatland was named UK Coach of the Year at the UK Coaching Awards, while the squad was named BBC Sports Personality Team of the Year. 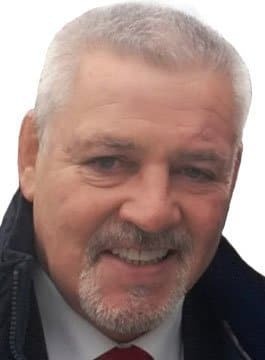 Warren Gatland OBE is available for Rugby After-Dinner Speeches and Motivational Keynote Speeches around the themes of Teamwork and Leadership.